Bondarchuk’s ‘Stalingrad’ was selected for the Oscars. Find out how Russia's first IMAX 3-D film was created. Russia has put forward the film "Stalingrad" by Fyodor Bondarchuk for the Oscar nomination. Now it is up to the American Film Academy to decide whether the ensemble will be one of the finalists in the “Best Foreign Language Film” category. However, the Oscar nomination is not the only thing that ties Bondarchuk’s film to North America. The work on “Stalingrad,” in many ways, was held right in the Los Angeles IMAX office: It is the first Russian film to be released in the IMAX 3-D format. "In order for a film to become an IMAX film, three conditions are necessary. First, it must be filmed by a director who makes its representation of paramount importance. Secondly, the studio we are on friendly terms with should produce it. Third, and most important, it should be a film that will take the viewer into a fictional but credible reality—to Hogwarts, to the space station Pandora, the bottom of the ocean, or the ruins of Stalingrad," Gregg Foster, president of IMAX Entertainment said, explaining the principles of the company’s operation. The conversation took place the day after the Los Angeles office showed excerpts from “Stalingrad” to Russian journalists for the first time. "Stalingrad" opens with a scene in Japan, in the devastated Fukushima. On the screen there is a huge Emergencies and Disaster Relief plane, which arrives at the scene of the explosion of a nuclear power plant. Russian rescue workers search for survivors. Under the rubble in the cavity, they find a German girl. Rescuers establish contact with her, and, in order to distract and calm her, the old commander begins to share his story: He tells her about the Battle of Stalingrad. The commander is an old man whose face the viewers do not see until the end of the movie. The next footage is the night crossing of the River Volga. Heroes move on submerged pontoons, tumble over the parapet and make an attack—but they are met by a fierce fire. Next, are the episodes with hand-to-hand combat, a deadly ballet filmed in the spirit of Wachowski or Zack Snyder. "Stalingrad" is a military epic with a romantic line, shot in a juicy and effective manner. A comparison of Bondarchuk’s new picture is all the more appropriate with the work of the abovementioned directors, considering the fact that Wachowski and Snyder filmed comics (“V for Vendetta,” “Watchmen,” “300”); but the genre has gained massive popularity, thanks to the tremendous demand for it among U.S. soldiers. Bondarchuk, however, chooses the images of other superheroes for inspiration—the real warriors of the Eastern Front, depicted by the narrative’s photo and film technicians. The officer who inspires the soldiers during the attack, fighters walking across the river as if on dry land: The Russian director willingly uses recognizable images from Soviet mass culture. 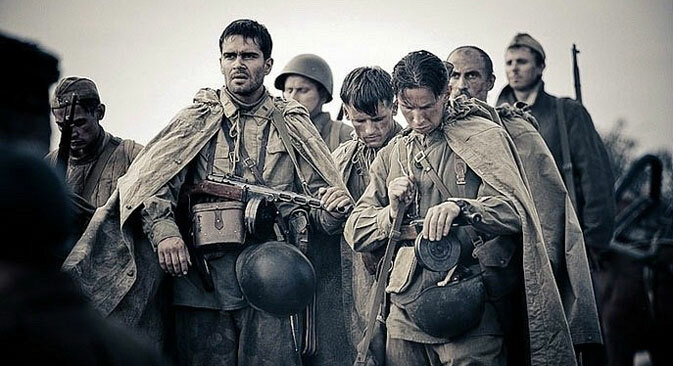 According to the director of IMAX international development, Anthony Vogelza, "Stalingrad" was not the first Russian film offered to his company. “There were about 10 pictures—for some reason, a lot of cartoons. You, in general, it seems to me, shoot too many cartoons," Vogelza said. In any event, the need for Russian fiction films in IMAX was evident. IMAX shows a sharp increase in profits: For the first six months of 2013, they have increased by 80 percent, compared with the same period of the previous year. At the same time, according to the president of IMAX, Russia is the third market after the United States and China for its corporation. In 2013, the number of IMAX theatres in the CIS increased from 24 to 38, which is more than one and a half times. The emergence of a Russian movie in 3-D IMAX format was only a matter of time. In order to create the film, a sizeable workforce and a lot of money was involved: Decorations used for “Stalingrad” cost 120,000,000 rubles ($4,000,000) alone. The film’s art director, Sergei Ivanov, was engaged in their development and had 400 people working for him for six months. Foster speaks about the picture only in superlatives. He argues that Russia has finally understood the meaning of IMAX, and more people are going to see blockbusters like Bondarchuk's film in their cinemas at home. It seems that "Stalingrad” opens another perspective. Hollywood, according to many experts, is going through a crisis of ideas and a shortage of cash, investments and markets. Hollywood film companies are drawing in an increasing number of Russian filmmakers—not just the young actors, but producers and directors in the production process.